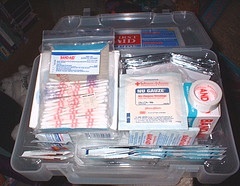 Can a Church Buy a First Aid Kit? Questions of authority for congregational action are important. We must not simply dismiss them with a wave of the hand because we don’t want to think about them or we just can’t imagine why something is wrong. When someone asks if a church can do something, we should pause, reflect, and look to the Scriptures. Usually, when we ask what the church can do, it comes down to what can the church spend money from its collection on. I’ve heard questions about buildings, song books, and a myriad of things. I’ve recently heard a new one. Can a church buy a first aid kit? I’d like to share three scriptural principles I believe help answer this question. 1) The church is authorized to relieve and to be prepared to relieve the needs of the saints. I Corinthians 16:1 says, “Now concerning the collection for the saints…” What is the collection for? It is for the saints. That is, it is primarily intended to help relieve needs among the saints. In Acts 4:32-37, the Christians were taking up a collection, pooling some funds in a treasury, and giving to each as any had need. Notice what this means. First, it means the church is authorized to relieve the needs of the brethren as they arise. Second, they didn’t have to wait until a need arose to prepare for it. Can a congregation pay for medical needs? If a brother or sister needs medical help, can the church provide for that? Absolutely. Do they have to wait until the medical need actually arises instead of preparing ahead of time? No. 2) Jesus relieved the physical needs of those who followed Him. In Matthew 15:32-38, Jesus saw the crowds that had followed Him. Jesus said, “I have compassion on the crowd because they have been with me now three days and have nothing to eat. And I am unwilling to send them away hungry, lest they faint on the way.” He then proceeded to feed 4000 people. Of course, we need to understand that Jesus did not use food to attract people to follow Him as so many want to use this passage. However, He did take care of the needs of those who were following Him. These 4000 had been with him for three days. They were in a desolate place and were in need. He took care of it. Certainly, we might all argue over how real was their need, couldn’t they have provided for themselves, couldn’t Jesus send them on their way and take care of them if they fainted? But Jesus didn’t argue for that. He saw a need among those who were assembled with Him and He met it. Can the church provide for the needs that arise as folks assemble with us? Can the church help these followers when their needs arise? If Jesus can do it, we can. 3) Jesus healed on the Sabbath. Here’s the point we need to see. The Pharisees were not allowing common sense about God’s will to govern their approach. I fear we can do the same thing on our question. This question is not about a church being a provider of social welfare to the community. This question is not about a church trying to become a medical clinic. This question is about whether or not a church can prepare to provide medical relief to those who are attending an assembly or class of the saints. This question is about whether or not a church can be prepared in the case of an emergency for someone in our assemblies and classes. Is this lawful? I believe the answer is yes, just as Jesus thought it was lawful to pull a sheep out of the pit and heal a man on the Sabbath. No doubt, some fear that a church purchasing a first aid kit might pave the way for all kinds of unauthorized activities. Why not let the church provide a medical clinic? Why not let the church provide a wellness center? We must not do those things because they are not authorized, but relieving the needs that arise while in our assemblies is. Being prepared to relieve the needs of folks in our assemblies and classes in the event of an emergency is not the same as providing a medical clinic or a wellness center anymore than paying a medical bill for a saint in need is the same as providing a medical clinic or a wellness center. This is true in just the same way that Jesus’ feeding the 5000 and the 4000 is not the same as opening a soup kitchen. This is true in just the same way that providing food for a widow in need is not the same as opening a restaurant. Some may suggest we are appealing to the physical desires of people in order to interest them in spiritual things. If we had medical supplies, like a first aid kit or a wheel chair, and were advertising to the community that they should come check out what we are doing because we’re ready for any medical emergencies or if we were inviting folks to a medical supply giveaway in order to get them to attend a class with us this could be a legitimate fear. However, if a church is not doing that but merely preparing for a potential need and emergency, then there is no need for the fear. A church being prepared to provide needed relief and benevolence ahead of time is not the same as appealing to physical desires to attract folks to spiritual teaching. This is true in just the same way that Jesus feeding the 5000 and the 4000 is not the same as using food to attract folks to hear His preaching. Some begin to bicker over cost and expedience. Some churches may go farther with this than others, buying epinephrine in case of allergic reaction, insulin in case of diabetic shock, or defibrillators in case of a heart attack. Some may refuse to go to certain lengths. However, at this point we are not dealing with scriptural authority (that has already been established), we are looking at congregational judgment on expedience. Each congregation has to give consideration to issues such as cost, likelihood of need, what responsibility the individual has, how others may interpret what the church is doing, etc. Different congregations may have different judgment regarding what is expedient based on all these issues. However, that is a judgment each group has to autonomously make and no congregation is allowed to elevate their judgment on expedience to the level of scriptural mandate. Further, different Christians within a congregation may have different judgment regarding what is expedient. While shepherds should be willing to listen to the judgment of the flock they guide, the sheep should be willing submit to their shepherds on these kinds of judgments instead of elevating their personal judgment to the level of scriptural mandate. Does a church have to buy a first aid kit? Of course not. Is a church scripturally authorized to buy a first aid kit? I believe the Scripture demonstrates we can.